Fascination Advantages help us see that we don’t need to be all things to all people. It’s easy to fall into the trap of multi-tasking. You feel that you need to do everything. Whether it’s because there’s no one else to do it, or you feel you can do it faster, the slippery slope is your life gets sucked into doing everything. Then what happens? You find yourself at capacity, stretched in a million directions and probably a little frustrated. You wouldn’t be there if you didn’t have a fabulous work ethic. You see the work; you do it. In fact, there’s chance you can’t not see it, right? If you’re like me, you get sucked in and it’s oh-so-tough to not fall into that black hole. What you aren’t seeing is that by doing everything, you are wasting time and energy doing stuff you aren’t programmed to do well. It’s not about work ethic; it’s about brain chemistry. Your personality is hardwired to be awesome in certain ways. But not every way. The beauty of the Fascination Advantages is you can clearly see where you are awesome, and where you’re not. Those Fascination Advantages, through the assessment report, show you what your genius zone is. The genius zone is where you make magic. It’s stuff you do so easily, it’s like breathing. Sure, you can do everything else. But you don’t have to be all things to all people. I’m Dormant Passion on the Fascination scale. It’s the least likely way I’ll be impactful or influential. It also is the most exhausting form of communication for me. Passion people use the language of relationships. They can easily be warm and fuzzy without even thinking. I’m so not warm and fuzzy! It takes focus and energy for me to be in that space. It’s not my genius zone. I’m more valuable in an inventive problem solving and strategy role. That’s my genius zone. Take some time to reflect on yourself. 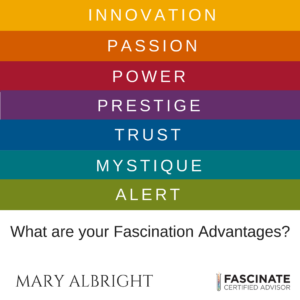 If you haven’t taken the Fascination Advantage Assessment, consider taking it. It’s 28 questions and takes 5 minutes. You’ll learn a lot about you and where your genius zone is.